Enavose, the Swiss-based skincare line, has officially launched a line of makeup items, too, and I'm pretty excited! The previous skincare products I've tried were pretty good, so I had good expectations for their makeup line, too. The product I tried was the Swiss Glacial Loose Powder with SPF15, which the company touts as a face powder perfect for setting your makeup, or for touch ups on hot summer days - perfect for the summer season. Enavose claims that the product has "encapsulated Swiss Glacial Water" that "releases hydration gradually into skin to provide up to 24 hours of hydration". Sounds great, right? 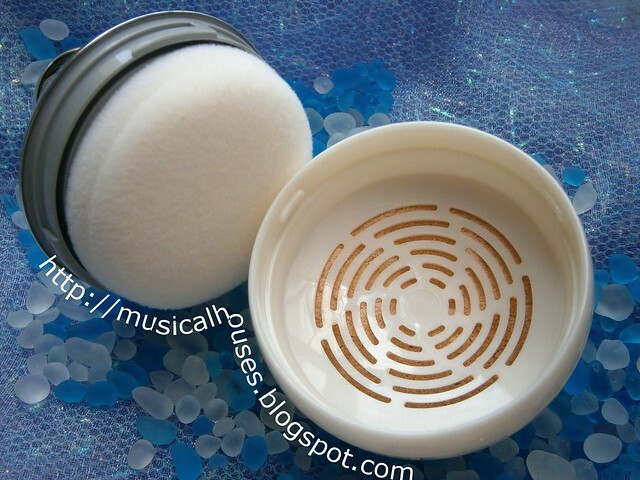 Enavose Swiss Glacial Loose Powder with SPF15 - look at the cool container! The Swiss Glacial Loose Powder comes in a small container, with a screw top lid. I found that the screw top lid pops off on occasion if you aren't careful to screw it on properly, so if you're planning to bring this while you travel, just make sure that you close the container properly. Attached to the screw top lid is an in-built powder puff, which I thought was quite a nice touch if you want to use it. The powder itself is contained in the bottom of the container, with a sifter on top. Pretty nifty! Bells and whistles: a in-built powder puff, and in-built sifter. The powder itself is a light peachy beige, with specks of gold shimmer for illumination - I guess this is the "reflective mineral pigments" advertised in the product that "diffuse light" and give your skin a "luminescent lustre". The powder is lightly pigmented, allowing for light coverage. Another thing I noticed about the product is that it has a really refreshing, cool feel when applied on the skin. It feels a little like spritzing your face with water when you apply it! I guess this is why they call it the Swiss Glacial Loose Powder! Unblended swatch of the Swiss Glacial Loose Powder - you can't see the gold glitter in this photo. Above, you can see an unblended swatch of the product, and the blended swatch below. You can see that the sparkles aren't really visible in the product, unless you're looking out for them. You can also see that the coverage is indeed sheer as the company advertises. I generally liked the powder, however I felt that the gold speckles in the powder didn't really do much for me, as on my skin I felt that they looked more like discrete sparkles rather than giving an overall glowy look. Fortunately, the powder only contains a minimal amount of speckle, so even if you're a glitter-shy kind of girl, you should still be able to get some mileage out of this product. 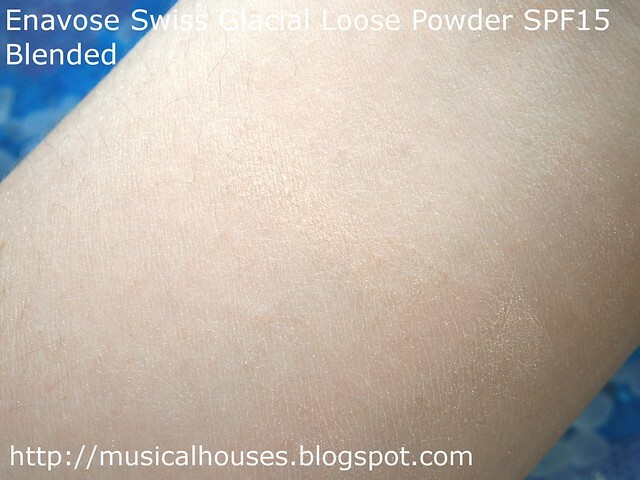 The Swiss Glacial Loose Powder, blended out. Love the cooling feeling! Would I recommend this product? At $29.90 for 5g of powder, this is not one of the cheaper options out there, although it won't break the bank. But if you don't mind the cost-to-amount-of-product ratio, then this isn't a bad choice. 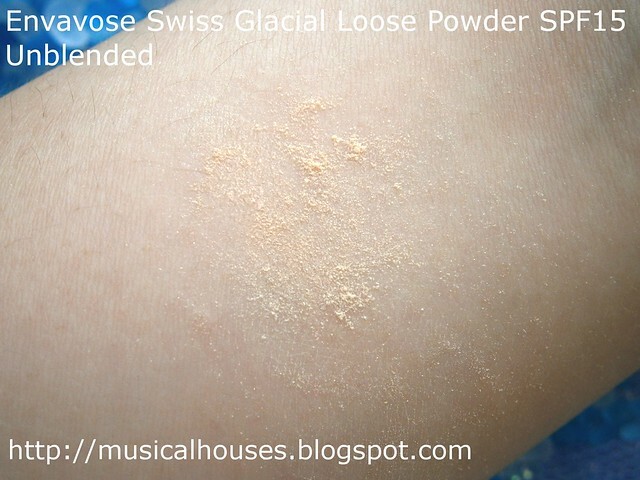 The Swiss Glacial Loose Powder has a nice peachy shade, a little bit of sparkle, a nice cooling sensation, and generally good feel and application. If that's what you're looking for, this is not a bad choice.